It’s here! It’s here! It’s here!! It’s the sporting world’s version of the Red Ryder BB Gun: The first college football Saturday. Black Bart was not a Pirate. The Friday before, we can never sleep. Well, we wouldn’t be able to sleep, if not for the fact that we usually start drinking around 5:30 pm Friday afternoons. When we awake at 10 the next morning, we scamper downstairs in footie pajamas to amazing visions of pregames and tailgates. Oh holy night! It is without hyperbole that this Saturday is the best day of the year. Obviously, the biggest news pertains to the quarterback situation. We could delve into this for hours, but we’re just kind of sick of it. We really don’t care at this point. The offense is going to score about 6 points a game no matter what, so what the hells the difference? If Stinespring isn’t running the ball, we’ll be breaking television sets anyways. Run. The. Ball. Sean Glennon is only one man. Will Glennon be a Bryan Randall or a Grant Noel? Hopefully the former. All he really needs to do is not f— it up and let the running game and defense win the games. And at the end of the day, at best Tyrod gets you to 10-2, and at worst Glennon gets you 8-4. For an extra year with a better team, we can handle a few more curse-filled rants. But we will need to throw at some point. Our starting wide receievers? Dyrell Roberts and Danny Coale. If you haven’t heard of them, don’t worry. Their mothers haven’t even heard of them. If this group of freshmen can perform as well as the outgoing class, we are going to have a great bunch of receivers we’ll never be able to get the ball to. In true Friday Night Lights style, we will only be referring to Kenny Lewis as Kenny Lewis. No Kenny or Lewis or KL or K-Lew. He is forever Kenny Lewis. Awesomely enough, one man that will also be getting some carries this year: Greg Booooooooooooone. Officially our favorite player. Just going to make that fact known. In the off season, Greg goes crabbing on the Northwestern. Bud Foster is still on the coaching staff, so the defense will be as solid as usual. Once again, the unit will keep us in every game. Orion and Cam will be wrecking balls in the middle. Kam Chancellor will return at least 3 interceptions for touchdowns. And Macho will again live up to the most badass name in all of football. Other stars will emerge throughout the season, and we’ll try in vain to come up with awesome nicknames. This is the first time in 108 years that we will play a football game in Charlotte. What was happening in 1900? Hawaii became a US territory. The Olympics as we know them today were held in Paris. The SECOND Olympics. And Tech lost to Clemson, 12-5. Most of the people we know who watched that game have not been able to get over it. Well, this one is for you guys. We’re 6-0 against the Pirates since we got good (circa 1994). As anyone from Pittsburgh will tell you, a good record against a team called the Pirates is not something to brag about. No official word on the rumor that Matt Morris will be starting at quarterback. The number one running back for the 2007 Pirates was lost to the first round of the draft, and this year’s presumptive number one is out with a knee injury. That would be the extent of our scouting. So what’s the deal with this game? Well, ECU is that team you don’t like playing. You know they’re better than people think, but clearly other people don’t think that way. Obviously we should win this game, but it will be closer than we’d all like. But the bigger question is who will lead us? In the tradition of thepensblog, we need a leader for each game. Hey, it worked for us during the playoffs. We need a solid win, but there’s no need to be flashy here. Just get the job done. It’s business. Not only is a hero, but he’s a truck driver, too. Get it done. Go Hokies. Alas, it’s time! We have officially kicked off the 2007-2008 college football season! For most teams, it’s just like any other start: the same 1AA cupcakes, the same ole’ blowouts; just another game. However, for an emotional Virginia Tech team, this day could not have come soon enough. Date back to April 16, 2007, a day that will forever be remembered as the Virginia Tech massacre. A day when a student opened fire and took the lives of 32 innocent souls who were in the wrong place at the wrong time; another handful were injured; the entire Hokie nation dismantled. No one has to tell you twice that the tragedy at Virginia Tech affected everyone. Hearts were broken, souls were lost, and emotions were high. What would save the Hokies? How could we ever overcome this horrible tragedy? I realize, of course, that Virginia Tech is a unified campus. We are not just one to shut down after something horrible has happened; we are one to unify and rebuild. Yes, our students, faculty, and staff all came together after this tragedy to make the Hokie nation stronger; yes, we were able to move on and continue with our lives, but the Hokies still needed something…just SOMETHING to bring it all together. 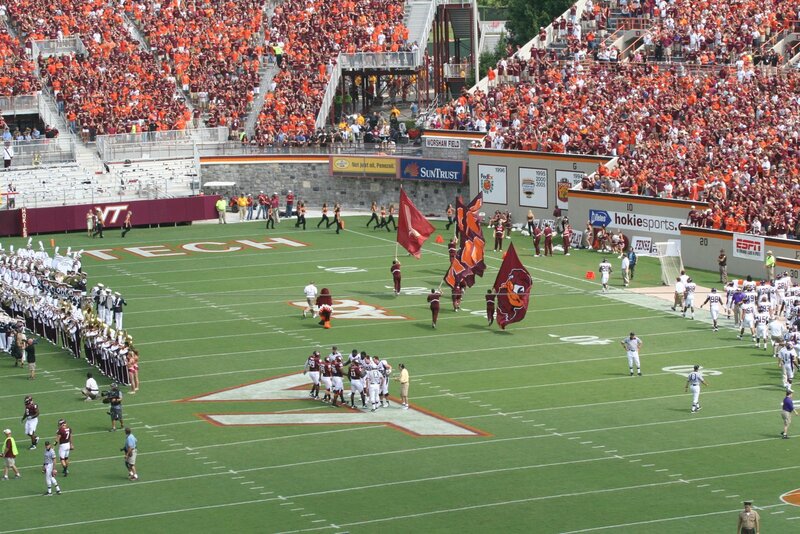 So, here we are…September 1st, 2007, opening day vs East Carolina University; just another home-opener, right? Wrong. This is what put VT on the map. Yes, our academics are high in quality and our campus life is like no other, but this is what Virginia Tech is all about: football. Lane Stadium has become a home venue that no team wants to play in – the noise and the emotion has always made Lane one of the toughest places to play in all of college football. This is what will bring the Hokie Nation closer than ever – 4 quarters…60 minutes…3600 seconds – however you want to put it. But in that little bit of time, Virginia Tech will take one giant leap toward recovery; albeit one small step in the grand scheme of things. So, give me “Enter Sandman” and let the road to recovery continue. This game will be played not just for the 32 victims in the tragedy, but the entire Hokie Nation. And even if just for today, we are ALL Hokies. You are currently browsing the archives for the East Carolina University category.